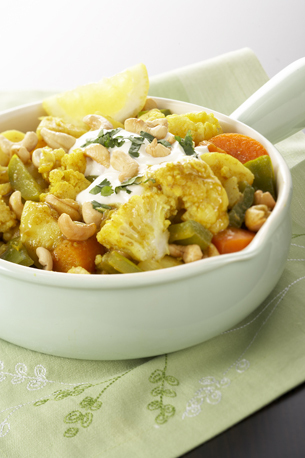 A great go-to vegetable curry can be easily tweaked according to what's in your fridge, in season or suits your own taste. Partners well with brown rice, a tabouli salad, or warm flat bread. Grate fresh ginger with skin on for speed, flavour and fibre. 1Heat NUTTELEX in a large frypan. Add onions and cook over moderate heat until soft but not brown. 2Add spices, ginger and garlic and cook for 1–2 minutes, stirring well. 3Mix through vegetables, add stock or water. Cover and simmer for 15–20 minutes or until vegetables are tender. 4Stir in cashew nuts and yoghurt. Do not boil. 5Garnish with chopped fresh coriander and serve.